Your chair should be easy to adjust from a seated position and should be on casters which allow you to swivel and move around the desk without much effort. The height of the chair should allow your knees to be level with your hips and your feet to rest flat on the floor or on a footrest. Armrests are helpful, especially if you have neck pain. Chairs with backrests should provide lumbar support. Ideally you should set the backrest height and angle such that the lumbar support rests against the small of the back. Some people even choose to sit on a large exercise ball because it causes the back to make frequent, fine adjustments and prevents stiffness. This can be tiring for those who are not used to it so always consult your physiotherapist first before you attempt to replace your chair with a ball. Most patients have computers placed too far in front from them (ie. placed too deep on the counter/desk). They end up slouching, reaching forward excessively and straining their neck. Ideally your desk should allow your elbows to be bent at an angle between 70˚ to 135˚. 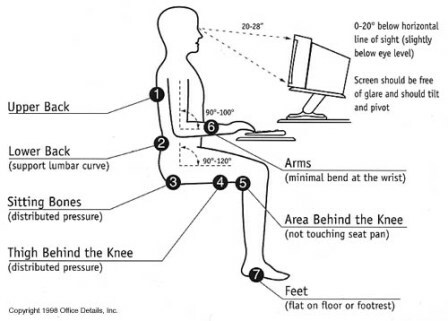 The forearms should be supported on the desk and the wrists should be straight. As you type, the fingers and hand should be moving instead of the wrist and forearm. The monitor should be placed centrally in your field of view. Repetitive strain problems may develop if you are chronically turning your neck to one side in order to look at a monitor. The top of the computer screen should be at or below eye level. Take a look at all your work tasks and try to rotate through them in a day so that you avoid doing the same task for more than two to three hours at one time. This will minimize the risk of developing repetitive strain injury. For example, if your tasks include making phone calls, typing and stapling, try not to spend more than two to three hours at a time doing each before switching to a different task. Change your working position frequently to avoid stiffness. Try to take a three to five-minute break from your workstation every hour. It is common for work to be a major stressor for people. We may associate stress in the neck and upper back with work, and feel less tension when we are away from the work environment. Fitting regular exercise into your life is a healthy way to help manage stress. Regular yoga, dance, running and swmiming are just a few examples. You will reap the benefits by having a stronger, healthier body as well as a more balanced lifestyle. In a world of laptops, Blackberries and iPads, convenience doesn’t always translate into something which is good for our backs. Small laptops and devices fit nicely on our laps or in our palms but they may cause us to slouch and spend hours surfing the internet in a poor posture. Remember to put the device on a desk instead of on your lap if you are planning to spend longer than 30 minutes. Consult your Cross Roads physiotherapist or an ergonomics specialist at work if you have further questions about your work station set-up.